Like death and taxes, we once thought that the weather was out of our control – however technology could one day enable us to manipulate the skies above. The Cloud Machine, created by interdisciplinary artist Karolina Sobecka, is a device for weather modification. 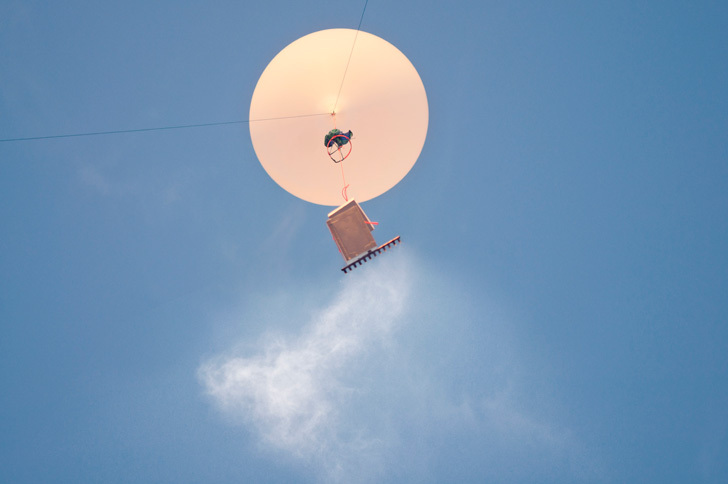 The contraption consists of a weather balloon carrying a small payload that disperses Cloud Condensation Nuclei (CCN), heat, and water vapor once it reaches a specific altitude. Moisture in the air condenses around the CCN, forming small clouds. Inspired by geo-engineering methods designed to create clouds to reflect solar radiation, the Cloud Machine is not only a statement on technology and how human activity changes the environment, but a possible way of combating the effects of global warming . Commissioned for a Blowup Event by V2_Institute for Unstable Media, the Cloud Machine is meant to explore the idea of “Object-oriented ontology (OOO),” or the aspects of a non-human centered worldview and how these ideas relate to the limits of knowledge. The machine is an extension of Sobecka’s work that explore public space and the interactions people have with their inventions. Under the banner of “speculative realism,” a term coined in 2007 by a conference chaired by Alberto Toscano, the philosophy rethinks the notion of people and their environment being separate entities. The Cloud Machine follows the ethos of a more democratic world view, harnessing the power of nature to show how even the smallest actions can come together to produce major shifts in physical world. Also the triboelectric effect in clouds not merely sun, forgot to meantion. I would think keeping them away from volcanoes and plate boundries would be wise. Clouds pass energy from the sun to the earth via lightning. Lightning adds static to the ground, static into energy, energy to expansion and electron excitement. Something to consider. Like death and taxes, we once thought that the weather was out of our control - however technology could one day enable us to manipulate the skies above. 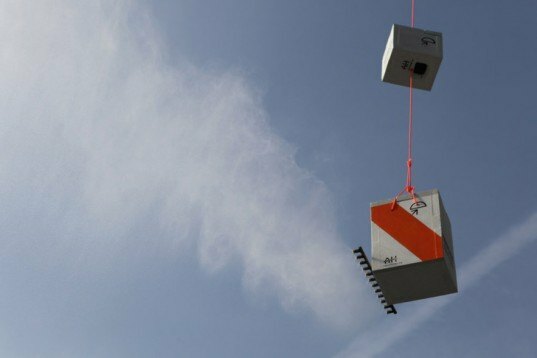 The Cloud Machine, created by interdisciplinary artist Karolina Sobecka, is a device for weather modification. The contraption consists of a weather balloon carrying a small payload that disperses Cloud Condensation Nuclei (CCN), heat, and water vapor once it reaches a specific altitude. Moisture in the air condenses around the CCN, forming small clouds. Inspired by geo-engineering methods designed to create clouds to reflect solar radiation, the Cloud Machine is not only a statement on technology and how human activity changes the environment, but a possible way of combating the effects of global warming .